David is a classically trained chef with four years’ experience. He studied at Tante Marie Culinary Academy whilst also working as a commis chef at the Academy’s restaurant. Following his graduation, he became a Senior Pastry Chef at The Restaurant at Tante Marie. David has since become a Patissier and senior member of the kitchen at the Woking based Le Papillon Patisserie. 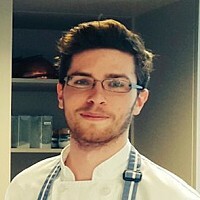 His infatuation with chocolate has led to long hours of self-taught practise culminating in creative creations; all of which have enhanced and extended his skills and techniques. He delights in making stunning chocolates with amazing flavours and beautiful designs.